Paul Fulton could have easily turned to his Silicon Valley connections to help bankroll a new product from his startup Cloudsona, which makes and sells wireless wristbands that synchronize with light shows at concerts, clubs and sporting events. The man knows people; he has held top positions at Compaq and 3Com and worked as an entrepreneur-in-residence at the Mayfield Fund before founding a software company that was later sold to Cisco. But to fund and launch Cloudsona's latest product, Fulton turned to Kickstarter. Cloudsona's crowdfunding campaign asked for $75,000 to produce Wave, a wristband and smartphone app that uses color codes to indicate who's calling or messaging the phone. 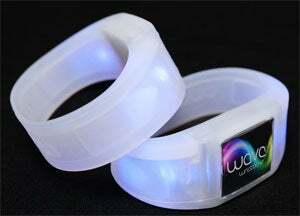 Kickstarter contributors who pledged $28 were promised first-production units of Wave; those who pledged $8,000 got the VIP package--special treatment at a Las Vegas nightclub, complete with limo, bodyguard and a hotel room on the Strip. Call it crowdfunding 2.0. Established companies are using Kickstarter and the like to launch new products, paid for by a built-in customer base before they hit the production line. But according to Fulton, the appeal is not limited to raising funds. "Just as important, we're looking to get feedback," he says. "This campaign is about market messaging and product viability. It's forcing us to think about how this product should be sold." Fulton admits, however, that crowdfunding comes in handy when traditional funders say no. Fulton didn't even bother going to VC firms with Wave because, he claims, they're not interested in hardware or entertainment. He's glad he took the route he did. "When you've gotten your Kickstarter funding, you get to keep all creative control," he says. "There are no money strings attached." Jeff Abramowitz, CEO of PowerCloud Systems in Palo Alto, Calif., likes the fact that crowdfunding puts him in touch with a new target audience. His company makes enterprise-grade, cloud-powered Wi-Fi products; when employees tested them out in their homes, they came up with the idea for Skydog, a cloud-managed app and Wi-Fi router for home networking. Through Kickstarter, PowerCloud asked for $75,000 to put Skydog into production, raising more than $120,000 from some 1,000 backers, some of whom were beta testers. "This isn't just a crowdfunding project; it's a crowd-involved project," Abramowitz says. "We're getting a community of supporters, and we're using their input to create new features and improve the product." If there is a downside, it's that there's no guarantee a company will get the money it needs. Take Fulton: By the end of the Wave campaign, Cloudsona had raised just $57,943 of its target $75,000. Still, Kickstarter is paying off. Both Fulton and Abramowitz say they're fielding requests from companies and organizations interested in partnerships and investments. "Overall, it has been a fun experience," Abramowitz says. "Doing the campaign got my team excited. And it paid off in helping us find a target customer base and a go-to-market pathway."